Hey there! Thank you for joining us on this edition of the Reading With Your Kids podcast! We have a very special show for you today. Our guest is Debbie Dadey, is an award-winning children’s book author, and co-author of 166 traditionally published children’s books, including The Adventures of the Bailey School Kids and the brand new Mermaid Tales! Debbie lives in a log cabin in the Smoky Mountains of Tennessee, with nature to inspire her writing. 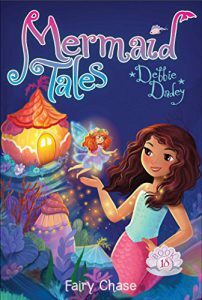 Fairy Chase (Mermaid Tales Book 18), is the newest in Debbie’s Mermaid Tales, a multi-cultural series from Simon and Schuster. Each Mermaid Tales book has an enchanting story couple with non-fiction components where readers learn about ocean creatures and plants. 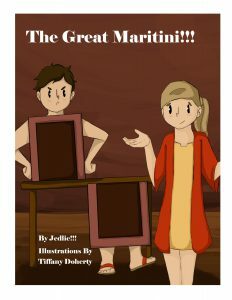 In our exciting interview with Debbie, She discusses Fairy Chase (Mermaid Tales Book 18), Her love for creating fun-filled stories that captivate the hearts of little kids, her love for learning about ocean creatures and plants, What’s next for Debbie, some interesting facts about her books and upcoming projects. So grab your cup of coffee and let’s get started! I used to be Debbie Gibson when I was a little kid growing up in Kentucky. I got in trouble for talking too much in school. In fact, I learned Abraham Lincoln’s Gettysburg address by heart because I had to write it so much in fifth grade (for punishment for talking). My older brother still lives in Kentucky. It’s a beautiful place with lots of pretty horses. If you’re ever in Henderson, KY. stop by Thomason’s BBQ for the best beans and mutton you’ve ever tasted and say Hi to my brother Frank. Now I live in Sevierville, TN with my husband Eric and our dogs Shadow. I’m very proud of my husband-he’s a smart scientist. He did work in the industry, but now he teaches pharmacy. Of course, he’d have to be special to put up with a kooky writer like me! My kids are awesome too. My oldest son graduated from Penn State and the University of Colorado and now I call him Dr. Nathan. Hurrah Nathan! My youngest son and daughter are totally fabulous too. They let me know when I’m not being very cool, like when I sing along to the radio (which I love to do!) My daughter attended Penn State, but now she is in graduate school. My youngest son is learning to be a motorcycle mechanic! spend lots of time watching my kids do their activities, like soccer. My youngest son is also into skateboarding and my daughter was really involved in the plays at her school. I also like playing the piano, hiking, scrapbooking, fixing up my log cabin, tennis, reading, and writing of course! With the help of her fantastic friends, Echo investigates whether or not fairies really DO exist in this sparkling Mermaid Tales adventure. But what will they find on their fairy hunt? Will all of Echo’s magical fairy dreams come true? Click the Amazon link below to grab your copy of Fairy Chase Today! Thank you, Debbie, for taking the time away to share your story with us and provide such successful insight! Read NextIntroducing JaJaJa Books: Bilingual Children’s Books with a Difference! !